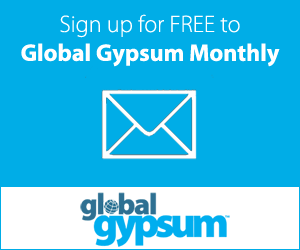 US: Mined gypsum supply in the US has risen by 43% to 3.41Mt in the first quarter of 2013 from 2.38Mt in the same quarter of 2012, according to a report from the United States Geological Survey (USGS). Imported gypsum production rose in the quarter year-on-year to 0.85Mt and synthetic gypsum production fell year-on-year to 1.79Mt. The overall total supply of gypsum rose by 21% year-on-year to 6.05Mt from 5.01Mt. Total supply of board products stood at 327MM2 for the first quarter of 2013, a slight decline compared to 334MM2 for the first quarter of 2012 and a 19% fall to 403MM2 in the fourth quarter of 2012. Major crude gypsum importers in the first quarter of 2013 included Mexico (0.34Mt), Canada (0.27Mt) and Spain (0.24Mt). US: The United States Geological Survey (USGS) has released data regarding gypsum production and consumption in the United States during 2012. This shows that a total of 9.9Mt of crude gypsum, 11.8Mt of synthetic gypsum and 12.1Mt of calcined gypsum was produced during the year. In 2011 the totals were 8.9Mt (crude), 11.8Mt (synthetic) and 11.9Mt (crude). Total consumption came to 24.6Mt, a 3.8% rise from 2011 when the country consumed 23.7Mt. The leading crude gypsum-producing States were, in descending order, Oklahoma, Texas, Iowa, Nevada, and California, which together accounted for 58% of total output. Overall, 47 companies produced gypsum in 34 states and around 90% of all gypsum was used in wallboard and plaster production. Around 12% of the gypsum consumed was imported. The USGS pointed to increased construction activity as the main driver of the increased demand, consumption (up 4%) and production (up 11%) of gypsum in the US in 2012. The average price of gypsum remained static at ~US$7/t crude (at mine) and ~US$30/t calcined (at plant). The USGS added that the US gypsum wallboard capacity in 2012 was in the region of 33Bn ft2 (3.07Bn m2). US: Gypsum production in the US has increased by 11% to 9.9Mt in 2012 compared to 8.9Mt in 2011, according to a report from the United States Geological Survey (USGS). The USGS attributed this rise to increases in activity in the US housing and construction markets. In its Mineral Commodity Summary for Gypsum in 2012, the USGS reported that the apparent consumption of gypsum increased by 4% to 24.6Mt in 2012 compared to 23.7Mt in 2011. Wallboard products sold rose slightly from 1.60BM2 in 2011 to 1.63BM2 in 2012. Overall, 47 companies produced gypsum in the US at 54 mines and plants in 34 States. Approximately 90% of domestic consumption, with a total of approximately 22Mt, was accounted for by manufacturers of wallboard and plaster products. At the beginning of 2012 the production capacity of operating wallboard plants in the US was about 3.07BM2/yr. In its overview of the industry the report commented that the US ranked fourth in the world for gypsum production after China, Iran and Spain. An increased use of wallboard in Asia, coupled with new gypsum product plants, spurred increased production in that region. The report expected that the worldwide production of gypsum would rise driven by the increasing popularity of wallboard due to its economy and efficiency. Lastly, it was noted that if the construction of wallboard plants designed to use synthetic gypsum from flue gas desulfurisation (FGD) units continues this will result in less mining of natural gypsum. The availability of inexpensive natural gas, however, may limit the increase of future FGD units and, therefore, the production of synthetic gypsum.